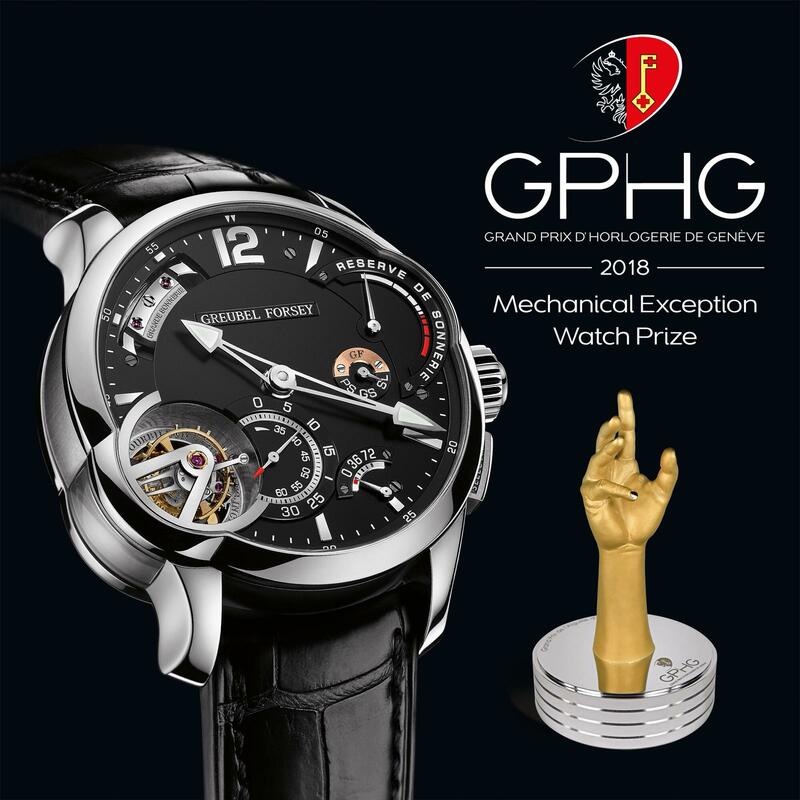 Friday 09 November 2018: The Grande Sonnerie, the most complex Greubel Forsey creation to date, has been awarded the “Mechanical Exception” prize at the Grand Prix d’Horlogerie de Genève (GPHG). After conducting 11 years of research and assembling no less than 935 parts, after filing two patents and incorporating Greubel Forsey’s third Fundamental Invention (Tourbillon 24 Secondes), and then developing an acoustic resonance cage generating an extreme purity of sound while installing eleven functional safety features ensuring unparalleled intuitive ease of use, and then performing a three-year wearing test… As highlighted by this only partial list of the stages involved, the creation of the Grande Sonnerie was indeed a monumental undertaking by Robert Greubel, Stephen Forsey and their team. This timepiece embodies the quintessence of their expertise and their ideal of horological excellence. – an entirely reasonable size given the complexity of the timepiece. The acoustics of this Grande Sonnerie are all the more impressive given that the timepiece is waterresistant to 3 Atm (approx. 30 metres), an outstanding accomplishment serving to ensure that the sound emits a clear, strong strike. Much like a stringed instrument, the titanium acoustic resonance cage was developed inside the caseband itself, so as to provide the loudest possible volume. The extremely pure crystalline strike is transmitted thanks to one-piece double cathedral gongs – on three levels and respectively sounding high and low notes – that are visible through the tourbillon’s lateral window. The two striking hammers are notably visible on the dial side, featuring flat black-polishing, hand bevelling and polished countersinks. The gold bridge supporting them is relief-engraved and has the same exceptional finishes, as well as straight-grained flanks. While the movement is manual-winding, the striking mechanism also features an automatic winding system by means of a platinum oscillating weight engraved with the Greubel Forsey guiding spirit – and delivering some 20 hours’ strike reserve in Grande Sonnerie mode. The Grande Sonnerie strikes the hours and quarters in passing, while the Petite Sonnerie sounds only the full hours in passing. A Silence mode can be activated via a pusher. On demand, a minute repeater and its additional mechanism strike the time to the exact quarter and minute. This timepiece also includes another feat thanks to a silent speed regulating governor, using an inertia flywheel specially designed to muffle the whirring sound habitually made by traditional strike speed regulation mechanisms. The timekeeping precision of the timepiece is ensured by the third Fundamental Invention: the Tourbillon 24 Secondes, which uses fast rotational speed and an inclined angle to solve the problem of the oscillator’s critical positions in relation to gravity. The 25° angle and the rapid revolution of the tourbillon cage significantly improves the precision timekeeping performance of a system comprising just one tourbillon, especially in static positions. Among the other salient characteristics of this timepiece are a frequency of 21,600 vibrations/hour and a chronometer-worthy power reserve of 82 hours. 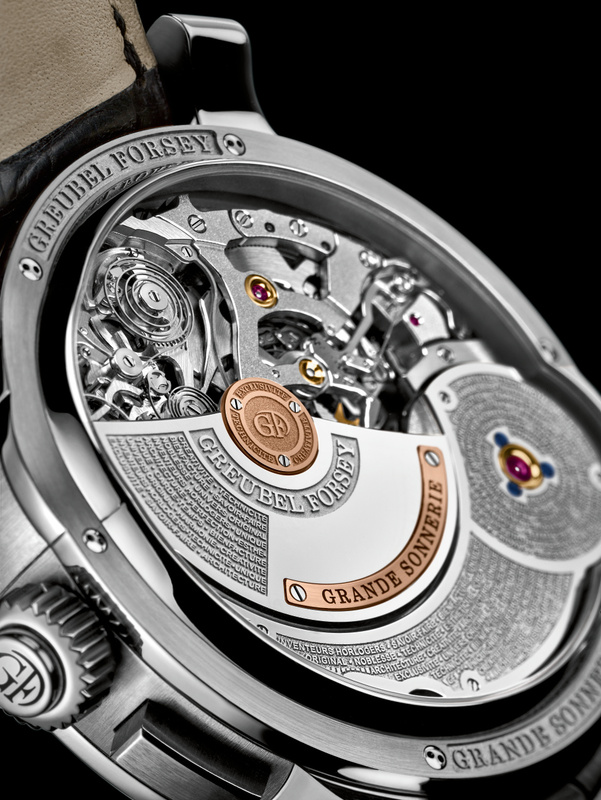 The Grande Sonnerie is an exclusive achievement attained by very few watchmakers. Despite its complexity, Greubel Forsey will aim to complete five to eight of these timepieces each year. 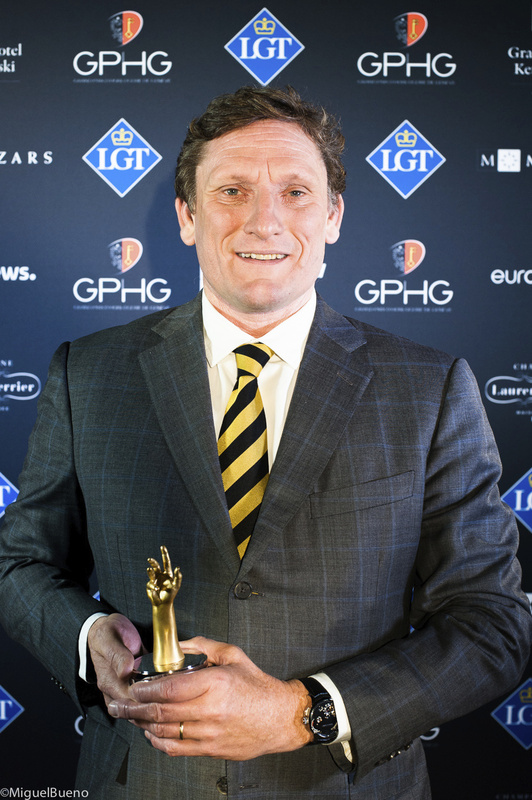 Robert Greubel and Stephen Forsey would like to express their warmest thanks to the entire Greubel Forsey team, without whom this great feat would not have been possible.